For other uses, see Castle Rock (disambiguation). Castlerock is a seaside village in County Londonderry, Northern Ireland. It is situated five miles west of Coleraine, and is part of Causeway Coast and Glens district. It is very popular with summer tourists, having numerous apartment blocks and two caravan sites. Castlerock Golf Club has both 9 and 18-hole links courses bounded by the beach, the River Bann and the Belfast to Derry railway line. The village had a recorded population of 1,287 people in the 2011 Census, and currently has a popular local football team called Villagers FC. Local historical interest is concentrated on the 18th century Bishop of Derry's ruined palace, the Mussenden Temple on the clifftop, and the Black Glen set within the Downhill Estate, which is now owned by the National Trust. The palace and estate were created by Frederick Hervey, 4th Earl of Bristol who was the Bishop of Derry in the 1780s. The Mussenden Temple, with its precarious perch on the basalt cliff edge is one of the most photographed scenes in Ireland. The 17th century Hezlett House is a thatched cottage with a cruck structure and is situated at the crossroads near the village. Built around 1691, it was originally a rectory or farmhouse. Also at the adjacent crossroads is an ancient tree. The bodies of the two victims of infamous dentist Colin Howell were found in Castlerock on May 19, 1991. Castlerock was relatively untouched by the Troubles, with only one fatal incident occurring in or near the village as part of the conflict. The "Castlerock killings" took place in March 1993, when four men were shot dead by a group calling itself "Ulster Freedom Fighters", a covername used by the Ulster Defence Association (UDA). One of the men convicted for the murders was Coleraine loyalist Torrens Knight. Castlerock is also home to Guysmere Summer Camp, which is owned and run by the Presbyterian Church. The actor James Nesbitt lived in Castlerock as a teenager. The village was also the holiday destination for the famous author C. S. Lewis. Born in Belfast, he holidayed in Castlerock as a child and took inspiration from Downhill House for some of his books including The Lion, the Witch and the Wardrobe. Castlerock railway station opened on 18 July 1853. Northern Ireland Railways currently run a mostly hourly service in both directions (west to Londonderry Waterside or east to Coleraine and onward to Belfast Lanyon Place and Belfast Great Victoria Street) daily, and only five trains each way on Sunday. 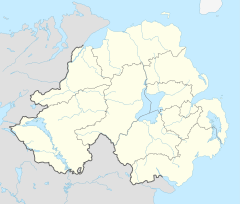 Ulsterbus services tend to coincide roughly with the times of the railway service and proceed either west towards Limavady or east to Coleraine. 3.4% of people aged 16–74 were unemployed. ^ a b Eccles, Jan (1996). Downhill: A Scrapbook of People and Place. London: Printing Ideas & Graphics. p. 184. ISBN 9780952748601. ^ Henderson, Deric; Young, David; McHugh, Michael (1 December 2010). "How evil dentist killed his wife and lover's husband". Coleraine Times. ^ "Chronology of the Conflict: March 1993". CAIN. Ulster University. ^ Cowan, Rosie; Bowcott, Owen (16 February 2006). "Freed Ulster killer 'paid £50,000 salary for being police informer". The Guardian. ^ "Castlerock station" (PDF). Railscot - Irish Railways. Retrieved 2007-08-30. ^ "Coleraine-Limavady service timetable". Ulsterbus. Archived from the original on 2011-06-16. Retrieved 2010-08-20. ^ "Limavady-Coleraine service timetable". Ulsterbus. Archived from the original on 2011-06-16. Retrieved 2010-08-20. This page was last edited on 2 December 2018, at 23:43 (UTC).